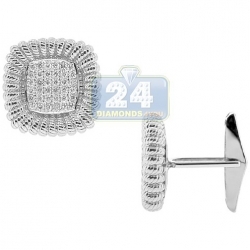 Expertly handcrafted in lustrous 14k white gold, these cuff links are encrusted with icy white round cut diamonds. 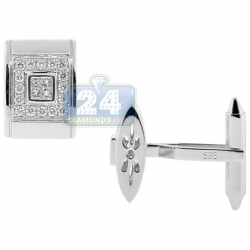 This pair of stunning men's cuff links has what it takes to make you a star at evening affairs! Stunning and elegant design of this jewelry piece is perfect for any occasion! 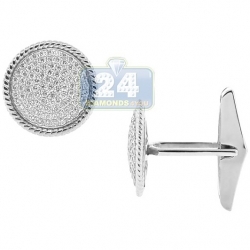 Featured 14k white gold 1.23 ct diamond round mens button cuff links are manufactured according to the highest jewelry standards by experienced professionals. 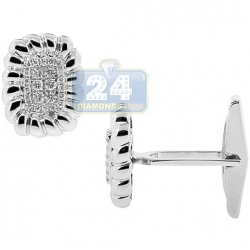 These cuff links need to be produced specially for you. And it is considered a custom order item. The sale on it would be final: non-refundable & non-returnable. Please note that once the order has been confirmed, it cannot be canceled.